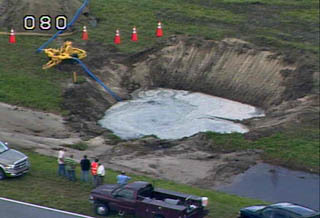 Ken Kremer for NASA Watch - Kennedy Space Center - NASA's Kennedy Space Center (KSC) and the Kennedy Space Center Visitor Complex were closed Wednesday morning when a 24 inch water main suddenly broke for unknown reasons. KSC re-opened in the afternoon for the second shift after water was restored to the center except for one administrative building and the Press Site. 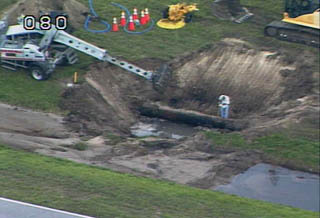 Crews were able to isolate the break in the pipe which sent water gushing out very near to buildings which prepare the Space Shuttle for flight. 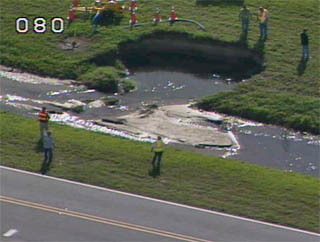 Teams are assessing Kennedy's water system to confirm there aren't any other potential problems. The Visitor complex remained closed all day, but will re-open on Thursday for normal operations. The nearby US Astronaut Hall of Fame, six miles west of the Visitor Complex, remained open to visitors all day today. 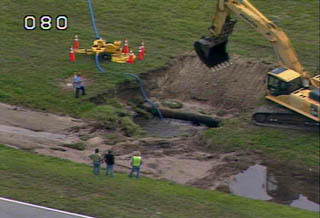 The rupture of a major water line occurred in a pipe located at the LC-39 Space Shuttle Complex turn basin near the Vehicle Assembly Building (VAB) and caused a shutdown of the KSC facility to all non-essential personnel. 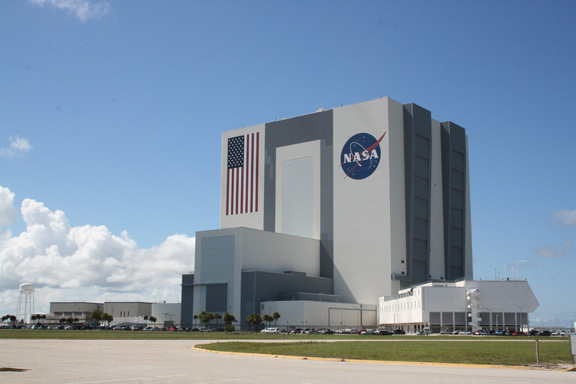 There was no potable water available at KSC and all restroom facilities were closed which necessitated the shutdown. Space Shuttle Discovery had been scheduled to be moved on a 76 wheeled transporter from a hanger known as the Orbiter Processing Facility-3 (OPF-3) to the VAB early this morning starting at 6:30 AM. This move is called "rollover" and the work is in preparation for the STS 133 mission to the International Space Station. STS 133 is the 39th and last scheduled flight of Discovery. I was onsite at the Kennedy Space Center Press Site early this morning to report on Discovery's rollover when the shutdown was announced and all non-essential personnel were directed to leave the center. Rollover of the 100 ton orbiter has been rescheduled for Thursday, Sep. 9 - weather permitting - and is not expected to impact the scheduled launch of Discovery which is now set Nov. 1. NASA plans to park Discovery outside the VAB for a few hours during the rollover. KSC employees have been invited to observe this momentous milestone leading to Discovery's final flight to space. Stay tuned to my reports at NASA Watch for Thursday's rollover of Discovery to be followed by mating of the orbiter to the External Tank and Solid Rocket Boosters.